« Watchmen Resources — Updated! The first thing I remember hearing director Zack Snyder say about his film version of Watchmen — at that time still in the works — was that that they were going to change the Nite Owl character’s costume to make it ‘cooler.’ That seemed to me pretty much to say all about his take on Alan Moore and Dave Gibbons’ comics masterpiece (1986-87). 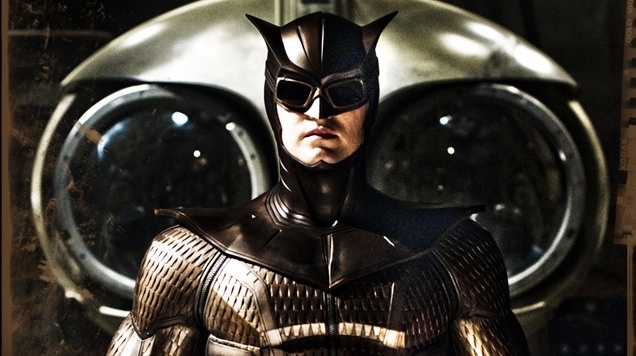 Nite Owl as he appears in the comic is meant to be a geeky superhero, slightly overweight and way out of touch with any concept of ‘cool,’ but apparently the director did not regard this concept as fully workable for his purposes. Having now seen the film, this prejudice has been largely confirmed. This is a ‘cool’ take on Watchmen, almost entirely superficial, although I hasten to add that it thankfully is not the disaster one might have feared. The cool manifests itself in a lot of ways — the high contrast, desaturated blue/brown colour timing, for one, is such a given in Hollywood action movies these days that I doubt many are going to miss the richly, almost garishly saturated, eye-popping colouring of the comic by John Higgins, but it could have been interesting to see a more adventurous approach here. Beyond that, and immediately noticeable is the way the violence of the original story, meant to show realistic destruction, is turned into the kind of extended bone-crunching action ballets that the director — pace 300 — seems to fancy himself an auteurial hand at. Short, profane bursts of mayhem would have been much more effective, not to mention congenial. (In this context I should add that he seems to entirely miss the point of the cast’s two most humane characters, Dan and Laurie, when he has them actually kill several of their assailants in the back alley mugging scene. WTF?). In other words, this is very much a fanboy film. On a surface level, it is extremely loyal to the comic’s basic structure, dialogue and presentation. Almost ploddingly so. I wonder how it works on somebody unfamiliar with the source, but to this viewer it seemed that its slavish devotion to the comic’s basic mise-en-scène clearly impaired it severely as a film. No scene really attains its own momentum, and despite a running time of over two-and-a-half hours, we never seem to be spending any real time with the characters. All we see are actors going through the motions of replicating each individual scene as loyally as possible, like singers lip synching in a music video. On the other hand, Moore’s prose is essential to what makes Watchmen great, so I can see why the scriptwriters and the director wanted to retain verbatim as much of it as possible. But this is the kind of challenge that demands a director with more talent and experience than Snyder obviously has in working with actors — animating this kind of dialogue is not impossible, but it requires players that do not sound like they are reading off a teleprompter. And really, the blame cannot really be laid on the actors themselves. OK, Jeffrey Dean Morgan as The Comedian is all ham (although he has a certain charm), Matthew Goode is entirely without the apollonian presence of Adrian Veidt/Ozymandias, and Malin Akerman is terrible as Laurie/Silk Spectre. But Patrick Wilson strikes rather well the balance between nebbishness and conscientious authority of Dan Dreiberg/Nite Owl, and Billy Cruddup, filtered through motion capture, does an admirable job of conveying Dr. Manhattan’s detachment and lingering humanity. And Jackie Earle Haley is convincingly menacing as Rorschach, despite the catastrophically bad choice of furnishing him with a hoarse “Dark Knight”-voice that makes his voiceover readings from his journal sound much more ridiculous than they should. A. O. Scott wrote an interesting and surprisingly self-revealing review in the New York Times in which he accused Watchmen of being sophomorically nihilistic. This seems a rather reductionist reading of the comic — the whole point is that we, humanity, do not need Men of Power to govern our lives, not to mention Nietzschean supermen. But he can be forgiven seeing the film this way, because it never manages to fully convey this rather subtle point of the original. A central problem is the film’s fetishisation of the heroes themselves, not the least in the combat scenes — they are much more glamorous than their sordid counterparts in the comic. Secondly, by toning down to the point of irrelevance the street corner where all the ‘ordinary’ members of the cast converge throughout the story, and crucially at the end, results in a fatal skewering of focus. It is clear that it would have been a challenge to incorporate this rather non-narrative element of the story, and cuts obviously had to be made in any case, but it seems to me that the film’s dogged focus on plot undermines the essential human dimension provided by the corner and its tertiary characters (perhaps it will be in the extended DVD version, but based what I have seen here, I rather doubt that Snyder could pull it off). Another casualty of this thinking is the lack of underlying patterning. It is not surprising that some of the structural complexity of the comic had to be left out, if nothing else because it is so tied to the comics form, but this nevertheless impoverishes the film. Transposing the “Fearful Symmetry” of the central chapter would probably have been a daunting challenge, and hard to make work, but surprisingly little attention is even paid to the recurrent focus on symmetrical motifs throughout the story, for example. Worse, however, is the treatment of the comic’s other tour-de-force storytelling sequence, the “Watchmaker” chapter, where Dr. Manhattan reviews his life-as-simultaneity. 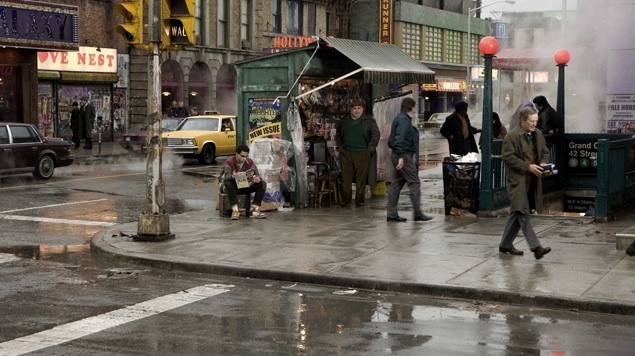 In the film, this is rendered as pedestrian set of nested flashbacks that rather quickly coalesce into chronology. True, this would have a real challenge to adapt, but should actually have been manageable, seeing that the storytelling in that chapter was itself indebted to Nicholas Roeg’s editing technique in such films as Performance (1970), The Man Who Fell to Earth (1976) and Bad Timing (1980), by way of Bryan Talbot’s Luther Arkwright comics (1978-89). A more skilled director would have taken his cue from this and given us a much more complex and accelerated montage of scenes — something, incidentally, that would only have contributed to the film’s cool factor. In other words the theme of time as an illusion, fundamental to the ethos of the story, is paid little more than lip service. Literally: Dr. Manhattan’s explications, especially in the key scene with Laurie on Mars — which strangely omits the defining “I’m just a puppet who can see the strings” line — ends up seeming mostly like exposition. In short, the film — for all its spectacle (Mars, for example is gorgeous, and the production design is generally excellent) — never manages to feel like cinema. All this being said, the film is not dreadful in any way. Just mediocre. And Snyder has done remarkably well in putting together a blockbuster type film that caters both to the fans and — apparently — a sizeable chunk of the popcorn crowd. There are even one or two sequences that are sufficiently well done to make me rethink scenes in the comic. The most notable to me was Rorschach’s death scene, where he takes off his mask and yells at Dr. Manhattan: “What are you waiting for? Do it !” (i.e. ‘kill me’). I had always read this as an instance of fanatic recalcitrance against the hush-up agreed upon by the other heroes, but in Jackie Earle Haley’s performance it becomes a desperate plea to relieve him of the duty he would otherwise feel to reveal Ozymandias’ plot to the world, potentially plunging it back into disastrous war-mongering. 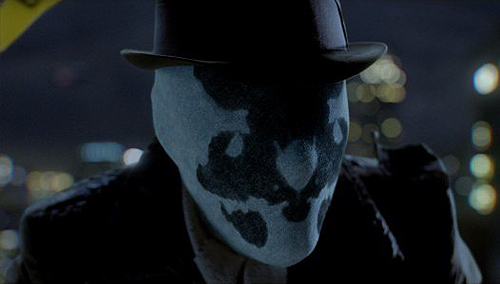 For a moment before he dies, Rorschach becomes plain Walter Kovacs again. This may not have been Moore’s intention, but it seems to me an entirely valid reading of the scene as it is presented in the comic too. Of course, he simultaneously knows that he has mailed his journal to the New Frontiersman, which to an extent absolves him of the guilt of thus compromising his principles, but one still wonders what thoughts are going through his head at that final moment. In the film, we also get the final scene at the offices of said right-wing paper (which unfortunately has been set up only in the flimsiest of ways). Here, again, we get what is probably a test screening-induced instance of heavy-handedness, assuring us that the contents of the journal will be revealed, which rather compromises the ambiguity of the original ending. Also, it is a mystery to me that somebody a loyal to the source as Snyder decides not to end the film with a closeup of the smiley face on the copy boy’s shirt, which in the comic serves to underscore its representation of time. Like the cool Nite Owl outfit, it says all. If you read Danish, you might want to check out this analysis of the storytelling strategies of Watchmen, written back when I was old.